There was delight and relief in equal measure for Sam Towner as he shook a monkey from his back last Sunday night. 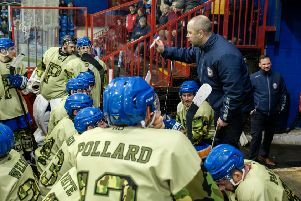 The summer capture finally opened his account after a frustrating start to life in the city – and it proved to be a rather important goal as the forward finally broke the resistance of lowly Bracknell at Planet Ice. The ex-Hull man made the breakthrough just before the mid-point of a tougher-than-expected night for Phantoms as they were made to sweat for a 2-0 success in the English Premier League. And Towner, who missed more than a month of the season with a head injury after being on the receiving end of a crude hit from Swindon import Max Birbrear in an early-October clash against the Wildcats, hopes it will prove to be the first of many goals in Phantoms colours. “That goal has been a long time coming,” admitted Towner. “My two linemates – Wehebe Darge and Owen Griffiths - did all the hard work and it was a pretty simple job for me just to finish the move off and put the puck in the net. “I scored in the shoot-out to win The Ashes in pre-season, but it has been frustrating to not manage a goal in a competitive game since. It is no forward’s cup of tea to go three months without scoring. “I’m not going to lie - it’s been a tough time for me as I was out for a few weeks. “I can safely say that was the most frustrating experience of my life and I think I probably let that affect my game when I did get back playing. “But my performances have been improving and my confidence is slowly returning now. The summer switch to Phantoms didn’t just mean a change of club for Towner after he impressed for Hull Pirates in their debut EPL campaign last term. It also meant a move away from the 21 year-old’s home city and family life. Towner added: “This is my first time living away from home and that was a big adjustment to make. “Peterborough is very different to Hull – there’s no sea for a start! – but I’m really enjoying the experience.